I am sharing today with my family and some friends! I have so much to be thankful for!! Are you ready for Thanksgiving? I am going into work for a couple of hours today and then I am off to the grocery store...I don't know why I wait until the day before Thanksgiving to shop (every year), probably because I dislike it so much! So I will hopefully brave the crowd and make it home in a good mood, lol! quick post...sorry I don't have any pictures today...I was pretty wiped out from all the waiting at the hospital yesterday. Mike did great (just a little slow coming off the anesthesia). 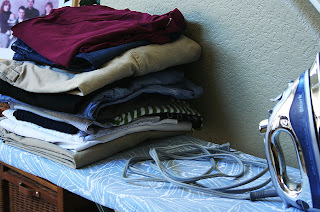 I also realized yesterday that it is probably a good thing I never went into nursing, lol! I had always wanted to be a nurse, but was pretty grossed out hanging out in the recovery room for 2 hours, while Mike tried to wake up yesterday...I say THANK YOU!!!! to nurses...you have to deal with lots of really gross stuff! Also thank you Maryanne for bringing dinner over last night!!! I was exhausted when I got home, and it was nice to not have to worry about that. It was de-lish!!!! Thanks again!!!! 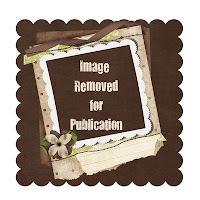 I am off to work this morning and leaving a little early to drive Mike to the doctor to have his bandage removed...he had some really large veins in his leg that were removed/lasered (just in case you wanted to know, lol!). I hope to have something to post tomorrow. Here we are back at Monday again...but at least this week is a short week *smile* (which reminds me...have to get my turkey!). I had a fun weekend! I finally pieced together a quilt that I had started about 2 years ago (crazy I know! ), and then on Saturday Ashley, Sharon (Josh's girlfriend), Maryanne (Sharon's mom), and I went to see the movie Twilight. I have not read the books (I was the only one in our group who didn't read them, sheesh!.). All in all it was a pretty good movie...I do have to say the main character was really HOT! And from a readers point of view...Ashley thought some parts in the beginning were a little cheesy...but enjoyed it overall (you know the book is always better). Okay...now onto the card: I made this one last week and got too busy to post it on Friday. I used the same set as the shoe card. I love these purses...aren't they cute? 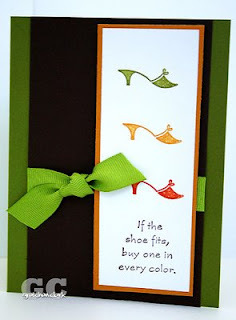 I feel the same way about purses, that I do about shoes...LOVE THEM!!! Today Mike is having out patient surgery on his leg...so I will be hanging out at the hospital for about 4-5 hours...I hope they have Wi-Fi, so I can do some serious blog surfing to pass the time...if you happen to think of it, say a little prayer for him at 10 am (mountain time). Yesterday Ashley and I had a fun morning...we went to Old Navy, Ulta, Pier 1, and Ross. She ended up getting some really great deals (Ashley is quite the bargain shopper!). I was mostly along for the ride, lol! Then we stopped off here for a light lunch (yummy! ), before we went to work-out. I really enjoy her company!!! So glad she lives so close by. I am still getting used to not having her home every night...which brings me to our Christmas photo...she isn't in it this year *sad face* It was kind of weird, but I will be taking one of her, Nate and Jax (their kitty) this weekend for their Christmas card. Thought I would post one of ours that didn't make the cut. I used Shutterfly again this year...I like them because you can use their sample Christmas cards (just drag and drop you photo), or you can make your own digi card (that is what I did again this year). I uploaded everything last Friday, and can you believe I got them in the mail yesterday? That was fast!!!! I will post it closer to Christmas, I don't want to spoil the surprise for everyone, lol! Oh yeah...this never got crossed off my list yesterday...but it is still waiting for me! Tonight is our family night...I am making this...it is really de-lish! I hope you week is going great!!! Quick post today, since I have lots to do. I am hoping to get the last few items checked off my to-do list before I go to work-out with Ashley and run into work for a few hours. I bought this stamp set "First in Fashion" from SU! probably 2 years ago, and just inked it up this week...gasp!!! I think the sentiment is so funny...because it reminds me of my mom. When she finds something she likes she buys it in every color (a trait she has passed along to me, lol!). I found out yesterday that one of the radio stations here in Phoenix is already playing their continuous Christmas music...usually that starts on Thanksgiving day. Since I can listen to Christmas music anytime...I switched my dial over to 99.9 FM (KEZ). I drove home from work singing "Silver Bells", lol! Too bad I couldn't convince everyone in the office to turn the dial yet (they think it is too early). 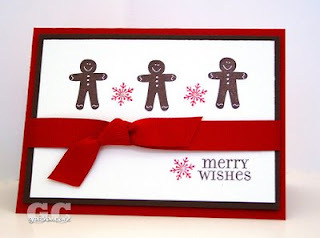 So with Christmas carols ringing in my head...I decided to post a Christmas card. 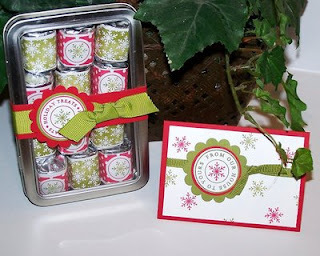 I really love this set, Hung up on the Holidays, from Stampin' Up! it is a little set but it has some cute images. I especially love this little gingerbread man...kinda makes me want a cookie. 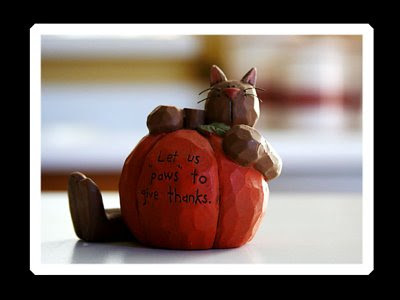 I can hardly believe that Thanksgiving is next week...then the craziness begins! Are you ready? I hope you had a fabulous weekend! I got almost everything crossed off my to-do list...so that made me happy! 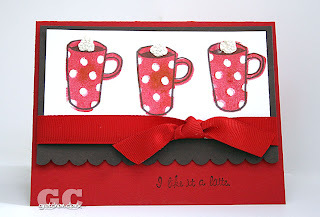 Here is a quick card I made with my Text Box stamp set. I really love the new color (from last months release), Ocean Tide...really pretty! I spent some time on Friday roaming around outside and in the house taking random pictures...I just LOVE my camera! Ever since I have moved my dial to "M" (for manual), picture taking is such a challenge. I have to say that some days I get bad, blurry, out of focus pictures...but that is the great thing about digital cameras...the delete button. 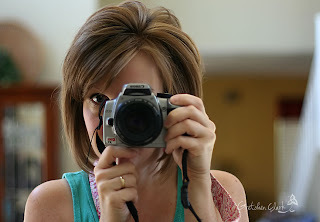 I have joined a photography forum (it is $6 per month)called Clickin Moms (not just for moms, btw). I have really learned so much over there!!! The people are really nice and really talented! I finally had the nerve to upload a photo in the "critique me" section. I was really nervous...but hey, that is how you l earn right? I have really been working on focus and especially focusing on peoples eyes...and since my family isn't really enthusiastic about posing for me, I grabbed one of Ashley's dolls from the garage, and shot away. So here is the picture I posted, and I think I got it this time (not counting all the others that didn't make it, lol!). Random note: I left the doll on my counter on Friday night...and when Josh and Sharon came home, they were really creeped out, lol! I suppose I should have warned them. We had dinner at our friends, Dave & Deb's house last night...thanks guys! It was a fun time, and delish! Today I am hoping to look like this, ha ha! 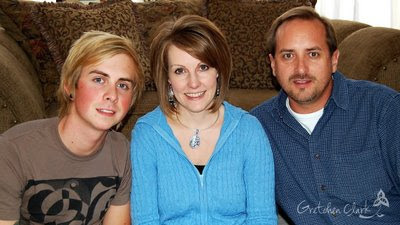 I will be taking Ashley & Nate's Christmas photo, and what ever else I can find to click away at, lol! I find photography so relaxing and rewarding...and I just love looking at pictures...Maybe I will have some good ones to share next week. 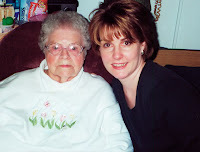 Today is my me'me's (grandma in french) funeral (She was 91)...She passed away last Sunday. This week I have been recalling some of the good memories I had growing up, I think my favorite is how every Christmas my me'me & pe'pe would drive to our house (they lived about 45 min away), and spend Christmas eve, Christmas day, and the day after Christmas at our house...My brother and I could hardly sleep on Christmas eve (I don't think we did), but we would wake up at like 4 a.m. to see if Santa had visited. We always woke up me'me who slept on the family room couch...she was a good sport...as we shook presents and tried to make noise so everyone else would get up...we had a lot of fun! I will always cherish the memories (and photos...must be why I love pictures so much)! I Wish I was able to fly back to CT to be with my brother, but it just didn't work out. I will be thinking of you today, Tim!!! Hug someone you love today and Enjoy your weekend! It is Thursday...and that means Friday is right around the corner...yippee! I really like how today's card turned out, I had no idea what I was doing when I started out to make this one, I just knew I wanted to use some patterned paper and these felt flowers that matched. I shifted things around for quite a while, until I came up with this layout. I even used some of my hoarded fire & Ice brads, lol! Yesterday after work I stopped over to visit Ashley (and Jax, her kitten), and to work out at her apartment weight room...we actually didn't talk each other out of it this week, lol! Then we decided to take a trip to the Dollar Tree (love that place), I stocked up on Christmas wrapping paper, curling ribbon, and tissue paper (now I just need some stuff to wrap). When Ashley and I were in the candy aisle...we spotted these...I had to get them for Josh, because I knew he would get a kick out of this grossness (is that a word?). I think I may have to go back and get some for my nephew too, (boys like the weirdest stuff!). They even had gummy boogers. I don't even think I can get past the grossness (there is that word again), to even give them a try...but boys will be boys...Josh said they were tasty. Thanks for visiting!!!! Have an Awesome day!!!! Can you believe that Christmas is a little over a month away...arghhhh! I always say every year that I am going to start my shopping/crafting early, but that never happens...I just don't feel like Christmas when it is in the 80-90's here in Phoenix. With the economy the way it is, it looks like Christmas will be a little lighter than usual...no biggie! I am trying to start a mental list in my head. It seems like every year new and exciting ideas for everyone gets harder and harder. It must mean that we really don't NEED anything. It really isn't about the gifts anyway, but I do have fun giving them! 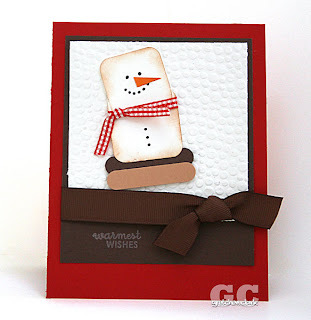 I saw a card similar to this one last year on Splitcoast Stampers...I thought it was really cute (I totally love snowmen!). I had to recreate it...it was pretty simple, used mostly punches (and my cuttlebug die...it was the closest one to snow that I had). I think this snowman looks like it could be a yummy snack...SMORES...Delish!!! snowmen & smores...how can you go wrong? Enjoy today, and thanks for stopping by! I hope your week is off to a great start...I have been busy trying to create our digi Christmas card, so I can get it sent off to Shutterfly ...My creativity was "out to lunch" yesterday...argh! I think I did finally come up with a design, which was pretty simple (such my style...less is more). I may change my mind tomorrow, though, lol! 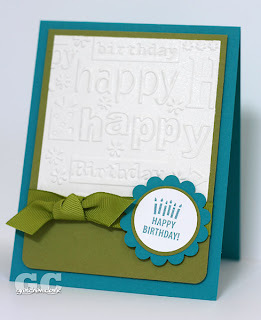 Have you seen the cute projects Nichole has on her blog for the new Papertrey release? So stinkin' cute!!!! Today card is a quick one...I dusted off my rub on's from SU! 's last SAB promotion, and made this easy card with them. I think it took my under 5 minutes to complete...how's that for easy? Have a great day today-Thanks for visiting!!!! white chocolate mocha with whip...yummy! I hope you had a great weekend! Mine was relaxing and too short, as usual, lol! Friday we went out to dinner at Carraba's with some friends from church (thanks! you know who you are! )...that was a lot of fun. Then Saturday morning, Ashley and Nate came over for haircuts...they brought us some yummy Starbucks coffee (non-fat white chocolate mocha...my fav! in their holiday red cups~I love that color!!!! )...which is where I got the idea for this card. I also added some whipped cream to the top of the cups with my liquid applique...and the best part is...it has 0 calories! Saturday afternoon, I got to play around with my camera and shot some photos of random stuff around the house and of course Peter (my cat, who is a great model, btw, lol!). It was nice to feel creative this weekend...love it! Sunday we took our family pictures (thanks Shar on for being our photographer) for our Christmas card (which I still have to design). I got a few that are possibilities, but you know how it is...it is hard to find one that everyone is happy with. Here is a picture of me and Josh when we were done snapping photos...he was a good sport, even though I had sketched out 10 possible poses for us (I am a little crazy like that, lol!). He is a great kid!!!! Isn't he the cutest? Enjoy your day~thanks for visiting!!!! I love Fridays...when I have the whole weekend ahead of me...especially because I can sleep in (which is around 7am for me, lol! ), and have coffee with my hubby on the sofa in my pj's. 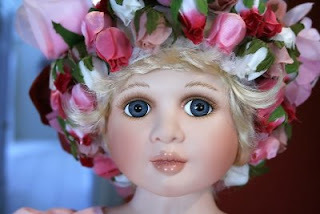 I have been reorganizing my craft room...again, (it seems like I am constantly moving stuff around in there)...am I the only one that does that? Plus I am always picking up my supplies/paper/scraps/etc since I have yet to figure out an organized way to papercraft...when I am stamping, it looks like a bomb went off when I am done...but it is fun! 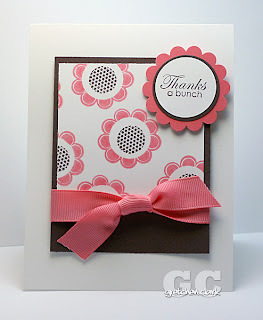 Here is another case of Nichole, with one of my favorite stamp sets (Floral Frenzy). It looks kind of similar to all my posts this week (I just noticed that, lol!). I will try to mix it up next week. I hope you have a relaxing weekend~Thanks for stopping by!!! The weekend is almost here...this week is zipping by. I am really ready for the weekend, though...I just cannot get enough of them! It has been getting cooler here in Phoenix...yesterday it was only 77 degrees...I love living here! Especially at Christmas time when I can rub it in to my family back in New England that it is in the upper 70's and sunny, lol! I sure do not miss the cold weather! I needed a birthday card for my dad (Nov 8th), and decided to use the same layout I used here. I just had to make it a little more "guy-ish"~I think this layout is gonna to be one of my fav's! Thanks for stopping by~Enjoy Today!!!! Just a quick post today...I HAD to have this stamp set!!! I just love, no LOVE coffee! I think it all began with my grandmother (who was Swedish, btw), she had coffee running through her veins. As far back as I can remember when I would go over to her house (which was a lot, since she lived practically next door), she would always have some sort of baked good and give me coffee to drink (of course I added tons of cream and sugar back then). I think that is why I love coffee so much today! It reminds me of my "Mor Mor" (that's grandma in Swedish). She always had time to sit down and have a cup of coffee with whoever came over, no matter what time it was or even if she was busy. I think a cup of coffee is like a warm hug...especially shared with a friend! That reminds me...I think Ashley and I need to have a Starbucks date real soon! Enjoy today! Thanks for visiting!!! Hope your day is off to a great start! Just a reminder to go and VOTE today!!!! Here are a few helpful links...if you want to know where to vote, general questions (example: times/ID requirements, etc), or to update your information~exercise your right!!!! Okay, onto the card. 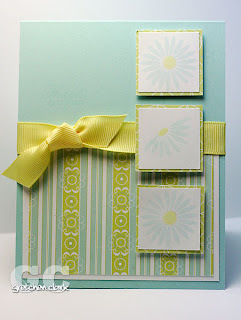 I have seen several cards lately on Splitcoast Stampers with this layout and I have been wanting to give it a try...so here is my take on it, Papertrey style;D Of course I had to use some of my favorite items...Aqua Mist/Floral Frenzy. Thanks for Visiting!!! Enjoy Today!!!! I hope you had a great weekend! Mike and I spent Saturday watching movies, we haven't done that in quite some time...it was so nice to just "veg-out" together (even if it was a guy movie and scary movie). Then we spent some time over at Ashley & Nate's, so I could play with thier new kitten, Jax...he is so little and cute! I even had some stamping time...so my weekend was complete. 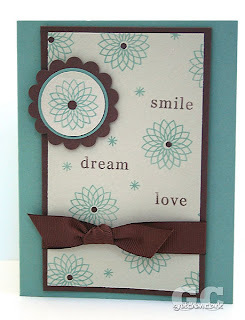 I have been struggling to get my stamping mojo back...and the best way for me to do that is to case a few cards that I like, then it starts to get the paper crafting juices flowing. 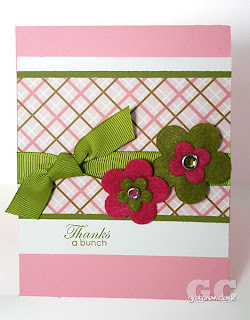 This card I think is so simple and pretty...of course I cased it from Nichole (who is a paper crafting genius!!!! ), I LOVE all her designs! I just think her style is so pretty and classy! Of course I tweaked mine just a bit and ran my white shimmery cardstock through my cuttlebug. 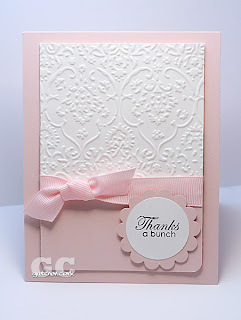 I also saw a quote on Nichole's blog that a card is like sending a hug with a fold in the middle...I thought that was such a great way to put it! I have several "hugs" to mail out this week! Thanks for stopping by~Have a Fabulous Day!!!! !